Thanks to its three acres of tropical gardens and a white coral sand beach, the Hotel Saks offers one of the best beaches in Placencia on the beautiful Caribbean coastline. The Hotel Saks in Placencia was previously known as Kitty’s Place and is located 1.5 miles north of the village of Placencia, within a short drive from the airstrip. 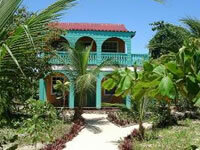 All 17 Caribbean style air-conditioned bungalows offer attractive private verandas with hammocks. The superior suites have two bedrooms, two bathrooms, a full kitchen and a private balcony. The Hotel Saks also has a nice restaurant offering many local dishes, serving a traditional one on Sundays “The Mayan Pibil” (chicken and pork seasoned with traditional Mayan spices, wrapped in banana leaf and baked underground). The beach bar is open daily and special entertainment is offered on Saturday nights. Great activities like scuba diving and snorkeling as well as sailing, sport fishing, and inland tours to Monkey River, Cockscomb Basin Jaguar Preserve, Mayan villages and Mayan Ruins can be arranged departing from Placencia.